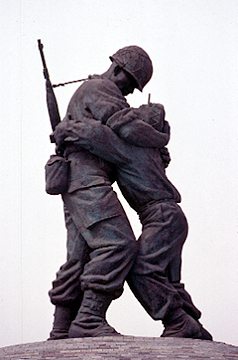 A large statue of a South Korean soldier holding his North Korean brother. It stands atop a dome-shaped memorial for the Korean War at the War Memorial Museum in Seoul. 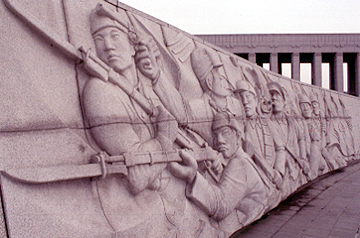 ..a stone bas-relief at the War Memorial Museum depicting the Korean independence fighters who opposed Japanese rule. This is probably one of the best museums I have ever visited. The building itself is beautiful, and the exhibits are very well done. A must-see if you're in Seoul. ..a plaque placed in the floor of the of the dome-shaped memorial at the museum. 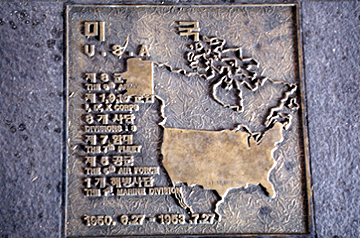 The contributions of 16 countries that fought on the United Nations side during the Korean War are depicted on plaques like this. This one depicts the U.S. contribution to the war. As you can see from the major military units listed on this plaque, U.S. involvement was significant. By late September 1950, the U.S. expeditionary force in Korea totaled 309,843 personnel, about half the total U.S. armed forces including nearly all of its combat-ready units in the world. In a curious reversal of policy, Washington made a huge commitment to land war in Asia on a narrow penninsula that most other strategists had declared peripheral, if not indefensible. 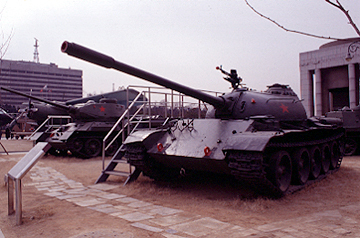 ..the museum has a large outdoor exhibit of military equipment, including tanks, (like these Soviet-made ones), planes, boats, missles, howitzers and radar apparatuses. 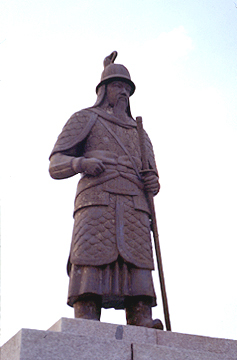 ..a statue of Yi Soon-shin, the great Korean admiral who defeated the Japanese in both 1592 and 1598. He did so by creating unique ships and using them with tremendous tactical skill. After his first victory in 1592, he was the victim of jealousy and was reduced to the rank of private, and later thrown in jail. When Japanese forces started arriving again in 1597, the Koreans pulled him out of jail and gave him back his commission. He died during the final battle, and became a national hero. He is highly revered in both North and South Korea to this day. 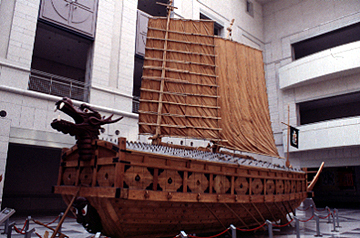 ..this is Admiral Yi's secret weapon, the 'turtle ship'. Well-armored and well-armed, these ships smashed the Japanese fleet and cut Hideyoshi's supply line to his troops in Korea, resulting in his defeat. ..at the museum is a large Korean War exhibit. 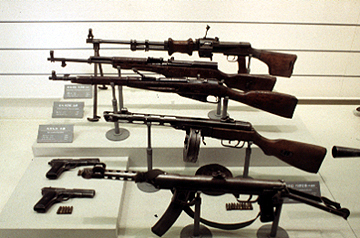 Here, infantry weapons used by the North Korean Army and the PLA (Chinese Army). 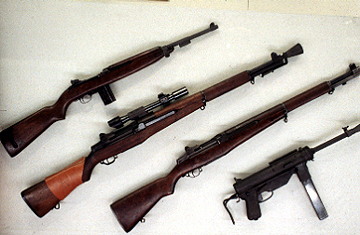 ..infantry weapons used by the U.S., South Korea, and many of the other allies. ..the museum has some great historical dioramas. 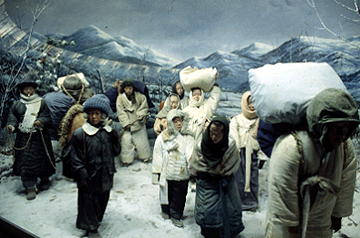 Depicted here are war refugees fleeing their homes. ..a diorama of the South Korean Army fighting in Vietnam. These soldiers are from the 'Paengma' (White Horse) Infantry Division. During the Vietnam War, South Korea was the recipient of great financial benefit, through U.S. military contracts and U.S. government aid to the Korean Army: Between 1965 and 1970, the USA gave the ROK $927 Million for its efforts in Vietnam. 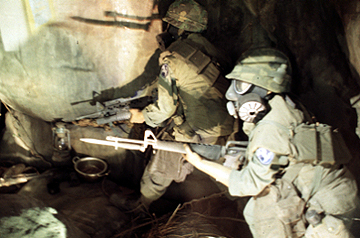 The great expansion of the Korean economy in the 70's and 80's also had its roots in the business it made during this war: The economic gain from the war in Vietnam alone was $380 Million by the end of 1968: This represented 16% of total receipts of foreign funds and 3% of the Korean Gross National Product. The Korean Army in Vietnam, however, was notorious. The U.S. commanding general, General Creighton Abrams considered the Korean Army in Vietnam 'a barbarous, over-paid-for mercenary force'. He estimated that it cost the U.S. taxpayers $400,000 in aid for every enemy combatant the Korean Army killed.